Every year in late April Earth passes through the dusty tail of Comet Thatcher (C/1861 G1), and the encounter causes a meteor shower--the Lyrids. This year the shower peaks on Tuesday, April 22nd. 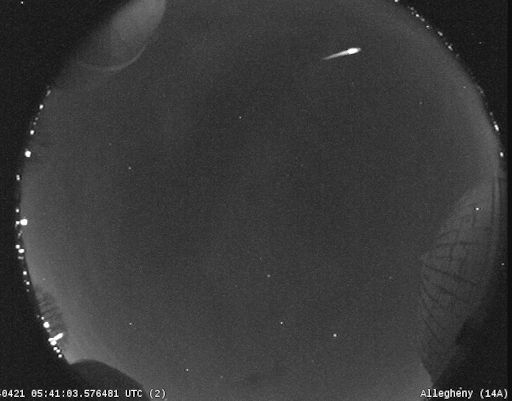 Forecasters expect 10 to 20 meteors per hour, although outbursts as high as 100 meteors per hour are possible. 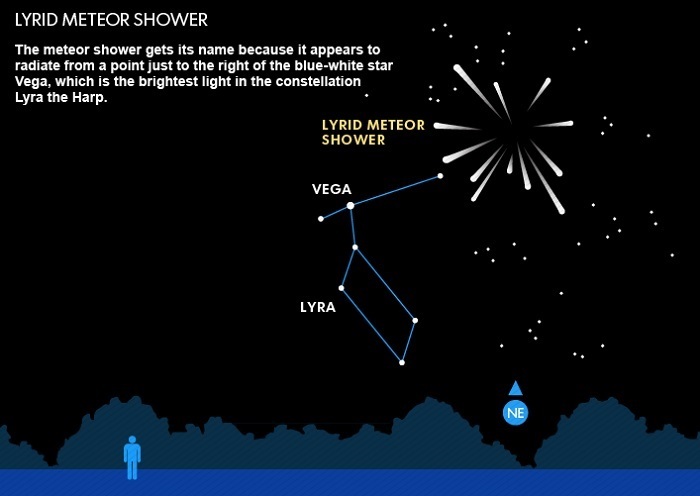 In fact, Lyrids have nothing to do with Vega. The true source of the shower is Comet Thatcher. Every year in April, Earth plows through Thatcher's dusty tail. Flakes of comet dust, most no bigger than grains of sand, strike Earth's atmosphere traveling 49 km/s (110,000 mph) and disintegrate as streaks of light. Lyrid meteors are typically as bright as the stars in the Big Dipper, which is to say of middling brightness. But some are more intense, even brighter than Venus. These "Lyrid fireballs" cast shadows for a split second and leave behind smokey debris trails that linger for minutes. What will the Lyrids do this year? The only way to know for sure is to go outside and look. Experienced meteor watchers suggest the following viewing strategy: Dress warmly. Bring a reclining chair, or spread a thick blanket over a flat spot of ground. Lie down and look up somewhat toward the east. Meteors can appear in any part of the sky, although their trails will tend to point back toward the radiant--i.e., toward Vega. Vega is a brilliant blue-white star about three times wider than our Sun and 25 light years away. You might have seen Vega in Carl Sagan's movie Contact. It was the source of alien radio transmissions to Earth. Usually the Lyrid meteor shower is mild (10-20 meteors per hour), but unmapped filaments of dust in the comet's tail sometimes trigger outbursts ten times stronger. So far this year's shower is trending toward the usual--that is, mild--but surprises are possible. Forecasters espect the shower to peak on April 22nd between the hours of 10:00 UT and 21:00 UT.